You are here: Home / Working Smarter / Do You Work Too Much? Start by thinking about what you do every day. Chances are that you do a lot of things that could be done by someone other than you. “But wait,” you say, “no one else can do these things as well as I can.” That is probably not true, but even if there is no one who could do them as well as you, there are probably people who could do them well enough. You don’t have to lower your standards, but you may need to broaden them a bit. If you are involved in client work, you may need to continue doing that work (at least for now). However, there are lots of other tasks that could be delegated to someone else. Think about how a law firm works. The top attorneys do the most critical work and other tasks are delegated to junior associates, paralegals and other support persons in the firm. The people whose time is most valuable (in terms of their billing rate) do not do clerical work and research. You shouldn’t spend your time on whatever the equivalent work is in your field. There may even be things that an outsourcer could do better than you can. For example, unless you are a graphic artist, design projects should probably be given to a pro. You may be a good writer, but are you a good copywriter? If not, hire someone to write your marketing copy. Perhaps you are willing to admit that you could use help with some of the time consuming and routine tasks in your business. But your objection is that you can’t afford to pay anyone to help. I would say that you can’t afford not to hire help. How much more could you earn if you had someone to handle invoicing and collections, bookkeeping, social media campaigns, posting to your blog, handling email and other routine tasks so that you could focus on billable hours and marketing to new clients? Not only would you earn more money, it is likely that you would do so while working fewer hours. Once you start delegating, look out for bottlenecks. If you are too involved in the day-to-day operations, that bottleneck is probably you. Do you insist that everything come through you so that you can decide what needs to be done and how it should be done? You may need to do a bit more supervising in the early days of delegating, to make sure that you team understands what is necessary, but do not micromanage. Once they know what to do, let them do it without having to check with you every step of the way. Letting go can be hard. You do not have to delegate or outsource everything in one day. Choose one or two time consuming tasks, and find someone who can do them. Once you have that running smoothly, choose a few other things you can turn over to that team member or someone else. Lather, rinse and repeat for great results! P.S. In addition to freeing up your time by delegating tasks to team members, look for ways to increase your earnings with passive income. 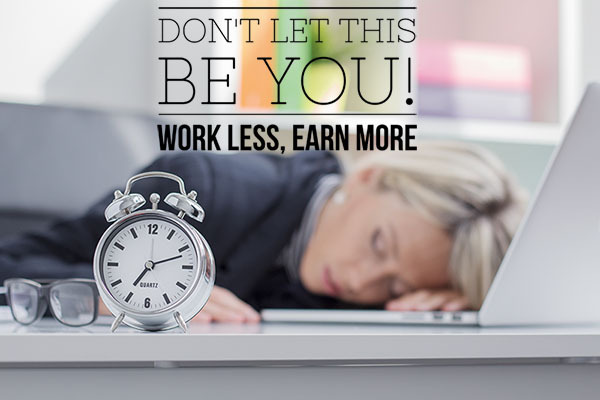 You can afford to work less! A writer/entrepreneur I greatly admire named Jon Acuff once said that trading in your day job to work for yourself is a huge risk because you trade one boss for dozens of new ones, named “mortgage”, “utility bills”, “credit cards” etc etc. In my opinion *that* is the reason we work much harder than we should. Ben Lloyd – Tech Write recently posted…Who needs copywriting? It’s so easy to get sucked into always doing one more thing when you work from home. It took reaching the point of mental and physical burnout a few years ago for me to start letting go and delegating more task. At the end of it, no matter how much you get done it won’t matter if you send yourself into full on burnout because you might find yourself with health issues unable to work for awhile. Then what was it all for? 🙁 Even if you don’t delegate tasks out, remember to step away once in awhile to take care of yourself. Very true, Loretta. There is always something else to do. I knew someone who put a lock on the door to his home office. At 5 p.m., he left the office, locked the door and didn’t go back until the next morning. That made it easier to have a clear demarcation between work time and home time. I’ve started “Delegating” by investing in tools that help make my work easier. I also delegate much of my real estate paperwork to my awesome transaction coordinator. Both of these free me up to work on other projects and I really appreciate that! Thanks for the wise words of advice. Cathy, you are so right. This can be a huge problem. One of my strategies is to have a set schedule for the day. I tell my wife that I could exist in prison (heaven forbid) because I can stick to my own schedule. Edgar, naps are great! A short nap in the afternoon can leave you refreshed and ready to take on the rest of the day.